Amatrol’s Mechatronics Ethernet Learning System – AB CompactLogix L16 (87-ENAB53A) covers the applicable skills and theory for EtherNet industrial communication networks used on automated lines in areas such as automotive, manufacturing, and packaging. Used in combination with a PC and two or more of Amatrol’s world-class mechatronics learning stations, the 87-ENAB53A covers major EtherNet topics such as network operation, installation, and configuration, data transfers between controllers, produced and consumed data, and using the message instruction. The 87-ENAB53 teaches how an EtherNet switch interfaces with programmable logic controllers to control and monitor an automated line. This learning system allows learners to practice industry-standard skills by interfacing two or more Allen-Bradley L16ER CompactLogix 5300 PLCs. Some of the real-world, hands-on skills that learners can practice include setting the IP address of a 1769-L16ER CompactLogix controller, configuring an MSG instruction to transfer data between ControlLogix controllers, and creating a User-Defined data type in a ControlLogix project. The 87-ENAB53A is used in combination with a PC and two or more of Amatrol’s world-class mechatronics learning stations featuring Allen-Bradley L16ER 5300 CompactLogix processors. 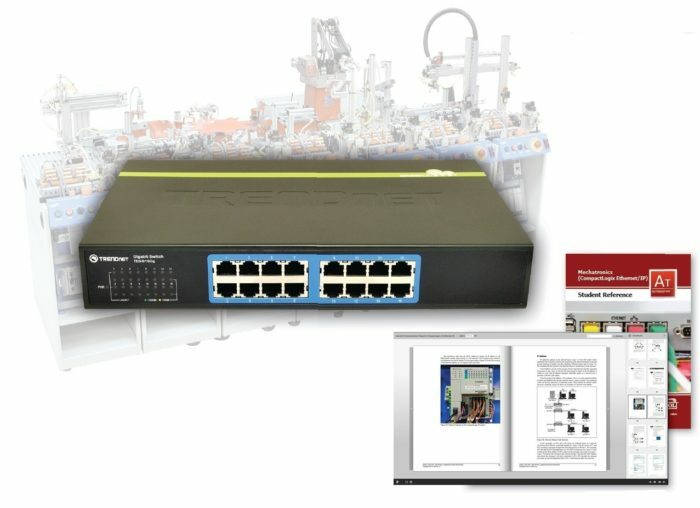 For the maximum learning experience, this learning system provides enough ports to connect all seven mechatronics stations, a PC, and eight additional EtherNet devices.